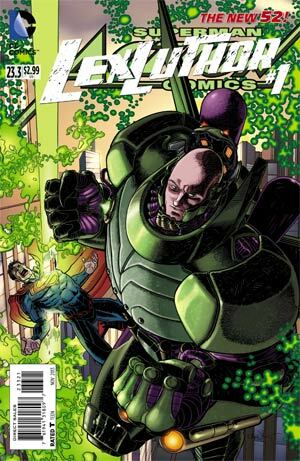 Story - 5: Lex Luthor is Superman's arch enemy. This seems like an obvious statement but if you look at how Lex has been treated since the start of the New 52 it's a bit hard to believe. His initial appearances in ACTION COMICS were rather lackluster. He wasn't engaging. He wasn't evil. He seemed to be a pale shadow of his former self, which is surprising because I thought Morrisson wrote a fantastic Lex in ALL-STAR SUPERMAN. The part he played in Morrison's final storyline was... well, it wasn't much of anything. Outside of that we've seen him do a pretty mediocre impersonation of Hannibal Lecter during H'EL ON EARTH, make an appearance in SUPERGIRL that didn't go anywhere and his part in SUPERMAN UNCHAINED has yet to be fully revealed. Earlier this month he played a major role in the first issue of FOREVER EVIL and while that seems like a lot of screen time it really hasn't amounted to much. With this issue Charles Soule started to turn that around... or at least I hope he has. I have no way of knowing if what he's established here will be carried over into Lex's future appearances but given how Lex was treated in FOREVER EVIL #1 I am feeling a bit better about the future of this character. One of my biggest problems with the New 52 is that we are told about things happening and how characters act but we haven't been shown a whole lot. Soule spent this entire issue showing us why Lex is the villain he is and he did it with style. A fine line was ridden through the course of the story and the wrong move could either make Lex's action so ambiguous that you are left scratching your head or it could have gone in the other direction and suddenly we have a mustache twirling villain. Soule went straight down the middle and the story was better for it. One of my favorite aspects of the issue was how Lex dealt with the fact that Superman had disappeared. At first I thought Soule was going to show an increasingly desperate Lex that lashes out because his one obstacle has failed to play the game. Instead we see a Lex that revels in the fact that his nemesis is gone. In fact, Superman not being around is the best thing for Lex because he can finally let his villain flag fly. Not only does he use the destruction of the space shuttle to eliminate an enemy but also to stick it to Superman for not being there. It is a complete 180 degree turn from the "if Superman wasn't here Lex would be this great man that cures cancer and stuff" Lex from the Post Infinite Crisis era. There were other elements of this story to enjoy. It was nice to see how Lex went from being all kinds of messed up in the face to looking hale and hearty in FOREVER EVIL. The whole bit with his personal assistant played out nicely as well and I loved how the new assistant's greeting at the end of the issue mirrored what the now deceased assistant sad. I also liked seeing Lex have some fun with his armor even if I am not all that hot on how the armor looks. All in all this was a fun story that will hopefully serve as the start of a new era for Lex, both as a character and as the main antagonist for Superman. Art - 4: The art in this issue was great. I loved how the story began with a split screen effect showing Lex going from convict to free man. It was a strong way to start the issue and let us know as readers that Lex was back. Bermudez and Green played in a lot of different sandboxes going from palatial estates to the edge of outer space and even threw in some fun with power armor for good measure. The power armor was my main problem with the art. The scene itself was dynamic, especially the two page spread but I am not a fan of Lex in a bulky suit of armor. Call me old fashioned but I like something closer to the classic power armor of the mid-eighties. I know it makes sense that the armor would be large and that it is, to a certain extent, more realistic. I just think the sleeker armor looks better. Other than that I have no real complaints with the art. Cover Art - 4: The bulky armor is my biggest issue with the cover but I just went over all of that in the art review so I won't go into it again here. The detail Kuder put into the armor was impressive. I just didn't like the size. Other than that and the fact that the 3D effect continues to make me motion sick this was a solid cover.